UPON RUINS is a band formed in 2014 that hail from New Glasgow, Nova Scotia. 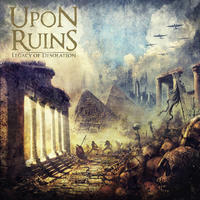 “Legacy of Desolation” is the band’s first album release. They play an easily digestible form of Melodic Death Metal that hearkens back to the Swedish greats of the 90's. There is also, though, a river of rich Heavy Metal steeped in tradition that runs throughout the record. “The Oncoming Storm” is a minute and a half intro comprised of guitar melodies that cast a feeling of regalia and triumph, a march head first into battle. It smoothly transitions into the first proper song, “Where Mountains Collide”. Rich textures of melody form the build-up to the main riff, a medium-paced affair that when placed next to the harsh vocals, sounds a bit like AMON AMARTH. What is consistent throughout is a strict obeisance to the confines of melody. Those looking for dissonant chords and abstract ideas would do better with the new OBSCURA or REVOCATION (both great albums, by the way). The fourth track, “In Flames and Decay,” begins with a straight-forward eighth note exercise that is then injected with some syncopation. “Forlorn Hope,” the sixth track serves as an exquisite classical interlude to divide the album. The title track follows, beginning with a very dramatic first riff. The change into a slower, more groove-based riff added a bit more aggression. At over seven and a half minutes, it is clearly the stand out track. UPON RUINS play a style that evokes early IN FLAMES in how everything compliments everything else. When the style first came about two decades ago, I was immediately intrigued by the juxtaposition of very melodic riffs against harsh Death Metal vocals. Now, though, it is practically the norm. It is more than obvious throughout the recording that the band plays from the heart. Some of the melodic lines are able to be held up against established tropes of the genre. The problem, though, is that after a while, the songs seem to blend together. What exactly would vault this band into the next level is hard to pinpoint. It just suffers from a marked sameness. For a first release from a four-year-old band, though, this is not bad considering. If anyone remembers the early BEHEMOTH albums, that was a far different band that the one that now stands atop the genre. Perhaps the perfect recipe for this band is to play more together. As stated, greater bands have come from humbler beginnings.